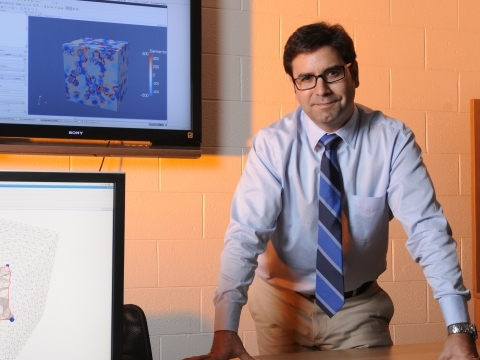 AE Professor Julian J. Rimoli, head of AE's Computational Solid Mechanics Lab, has received a Grainger Foundation Grant to apply his tensegrity research to the construction of a hybrid vehicle that will allow scientists to land on asteroids, moons, and comets. 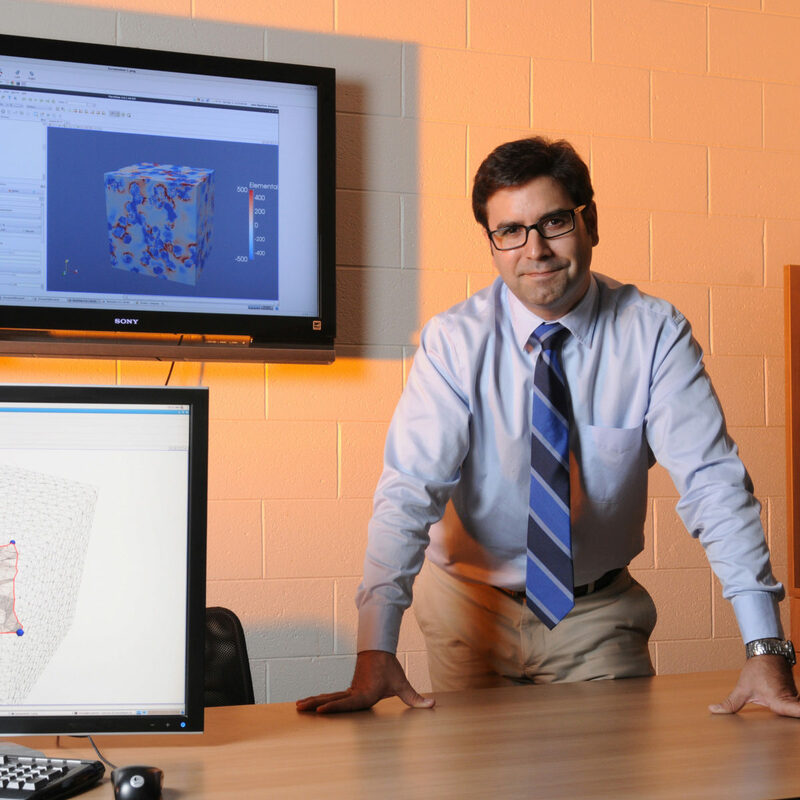 The National Academy of Engineering announced this week that AE professor Dr. Julian Rimoli has been selected to receive a $30,000 Grainger Foundation Frontiers of Engineering Grant to support his research on tensegrity planetary landers. Ready to Land. 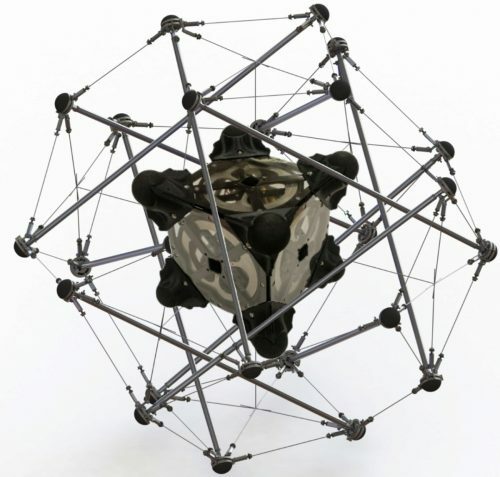 The tensegrity structure is designed to protect the Hedgehog rover during an unmanned landing. Rimoli shares this honor with his research colleague, Stanford University professor Marco Pavone, with whom he will be collaborating to develop an unmanned vehicle capable of landing and controlling itself in the low-gravity, rough terrain environments typically found on asteroids, comets, and irregular moons. The Grainger is awarded annually to select members of the National Academy of Engineering’s (NAE) US Frontiers of Engineering (FOE) Symposium. Rimoli was invited to participate in the 2016 FOE symposium, held in Irvine, California last fall. Rimoli and Pavone have independently developed concepts that make a hybrid vehicle a very distinct possibility. Rimoli’s work, showcased recently in the Journal Mechanics of Materials, explores the capabilities of compliant tensegrities -- sparsely built skeletal structures that look more like a child’s jungle gym than a space vehicle. In fact, these structures are able to store large amounts of strain energy upon impact with minimum structural mass, significantly reducing the cost of a mission. Perfect for landing on rough terrain. Pavone’s work centers on Hedgehog, an internally actuated rover that has demonstrated unprecedented levels of hopping control in reduced-gravity experiments. Perfect for exploring far away asteroids. Several research groups have developed hopping rovers for mobile surface exploration, but, without in-flight propulsion systems to steer them, these hoppers run into problems when trying to control their hopping and their landing. Rimoli and Pavone have confidence that they can tackle these challenges. The two researchers plan to encase Pavone’s Hedgehog rover within one of Rimoli’s tensegrity structures. This configuration is designed to exploit the controlled mobility of the rover by employing the energy storage capabilities of the tensegrity to mitigate undesirable rebounds. The same mechanism will then be adopted to control landing between hops during exploration. Also receiving the 2017 Grainger grant are Amin Karbasi (Yale University) and Amit Surana (United Technologies Research Center) who will use it to develop a unified approach for saliency detection in heterogeneous temporal data. Frontiers of Engineering is an NAE program that brings together outstanding early-career engineers from industry, academia, and government to discuss pioneering technical work and leading-edge research in various engineering fields and industry sectors. The goal is to facilitate interactions and exchange of techniques and approaches across fields and facilitate networking among the next generation of engineering leaders. The Grainger Foundation Frontiers of Engineering Grants provide seed funding for US FOE participants who are at US-based institutions to enable further pursuit of important new interdisciplinary research and projects stimulated by the US FOE symposia. The Grainger Foundation, an independent, private foundation, based in Lake Forest, Illinois, was established in 1949 by William W. Grainger, founder of W.W. Grainger Inc. Founded in 1964, the US National Academy of Engineering is a private, independent, nonprofit institution that provides engineering leadership in service to the nation. Its mission is to advance the well-being of the nation by promoting a vibrant engineering profession and by marshalling the expertise and insights of eminent engineers to provide independent advice to the federal government on matters involving engineering and technology.